The year is off to a toasty start globally ... and not in a comforting way for those concerned about another year of high temperatures, sea ice record lows at both Poles, and mounting risks to coral reefs. With the first quarter of 2017 now past, the year is shaping up to be one of climate extremes: high temperatures, low sea ice, and coral bleaching. Global surface temperatures continue to increase in-line with climate model predictions, and the world has now experienced an increased global temperature of about 0.8 degrees C (1.5 degrees F) since 1970. 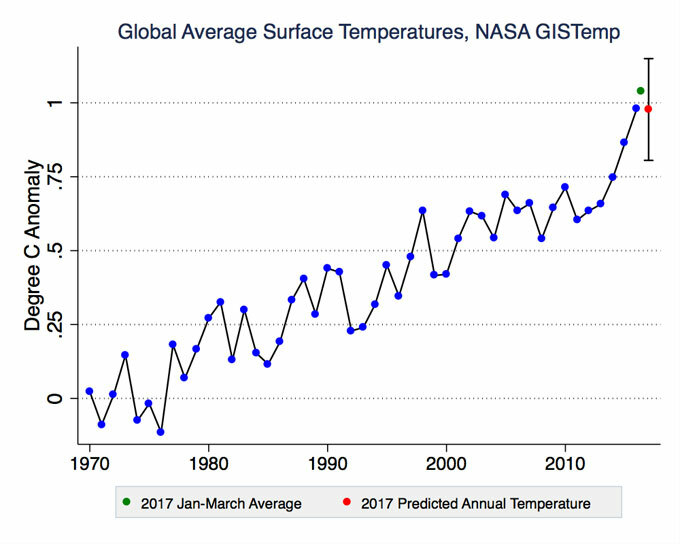 Temperatures for the first three months of the year were actually warmer than the 2016 average, and there is a reasonable chance that 2017 for a fourth consecutive year will be the warmest on record. 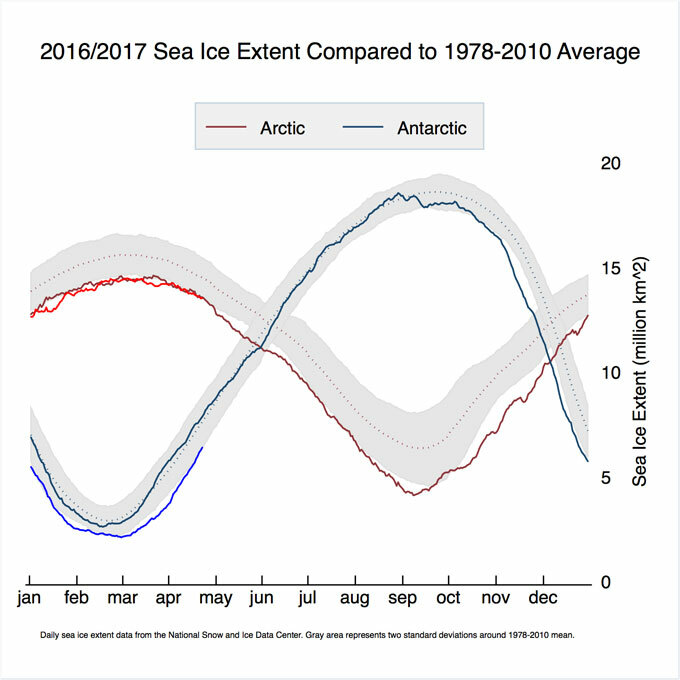 Global sea ice extent is near historic lows in the Arctic and Antarctic, and Arctic sea ice volume has also been decreasing as it ages and thins, with less new ice to replace it. 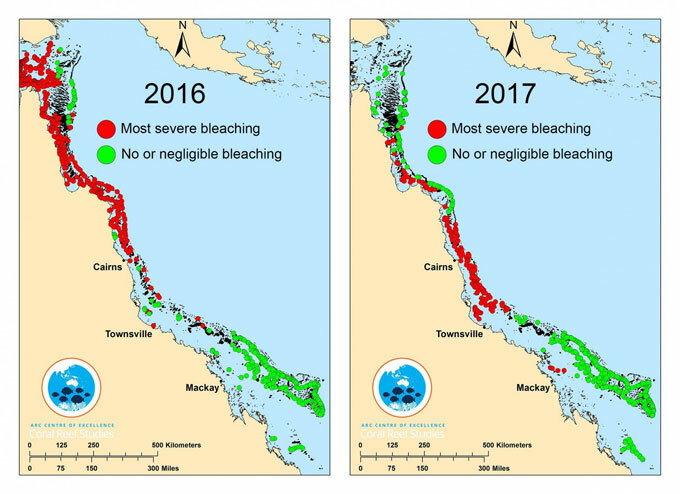 The Great Barrier Reef experienced an unprecedented second consecutive year of coral bleaching, the only major coral bleaching on record to have occurred other than in an El Niño year. Global surface temperatures were surprisingly warm in the first quarter of 2017. Despite the end of the large 2015/2016 El Niño, temperatures remained high with January, February, and March each being the second warmest on record, after 2016. Average temperatures during the first three months of 2017 were warmer than the average of all months in 2016; taking into account the current El Niňo status and the historical relationships between January-March and annual temperatures, estimates are that there is about a 50/50 chance that 2017 will surpass 2016 as the warmest year on record. 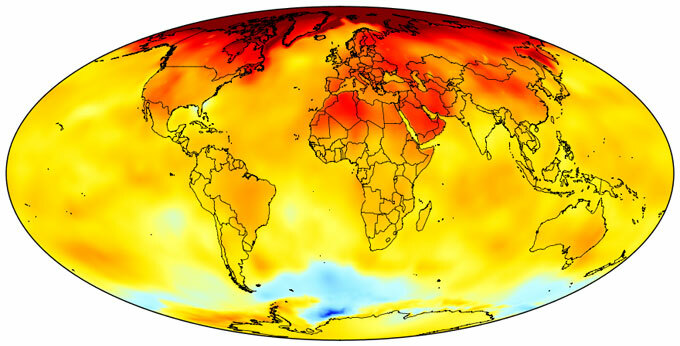 The figure above shows the NASA global surface temperature record, combining weather station measurements over land with data from ships and buoys in the oceans. Temperatures have increased fairly consistently since 1970, the start of the “modern warm period” when the climate effects of human emissions became large enough to be judged the main driver of climate change. Much of the year-to-year variation can be explained by El Niño and La Niña events, which are associated with globally warmer and cooler temperatures respectively. The green dot represents the average of January through March 2017; the red dot and error bars represent the best prediction of full-year 2017 annual temperatures. 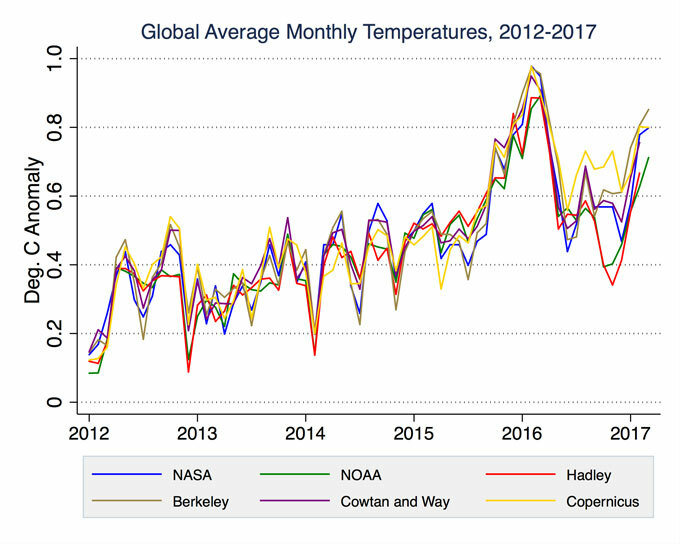 Looking at estimates of global temperatures published in recent months by six different groups (NASA, NOAA, the U.K. Hadley Centre/MET Office, Berkeley Earth, Cowtan and Way, and the EU Copernicus project), one sees the large impact of El Niño in late 2015 and early 2016, followed by a fall in temperatures in late 2016 resulting from cooler La Niña conditions. In recent months temperatures have increased in all the groups, though there is some disagreement between those estimating temperatures in large areas of the Arctic where measurements are limited (NASA, Berkeley, Cowtan and Way, and Copernicus) and those that do not (NOAA and Hadley). Although El Niño drove a portion of the record warmth the world experienced in 2016, it has not so far been a major factor in 2017. When the year began, experts anticipated a move away from a very mild cooler La Niña event. 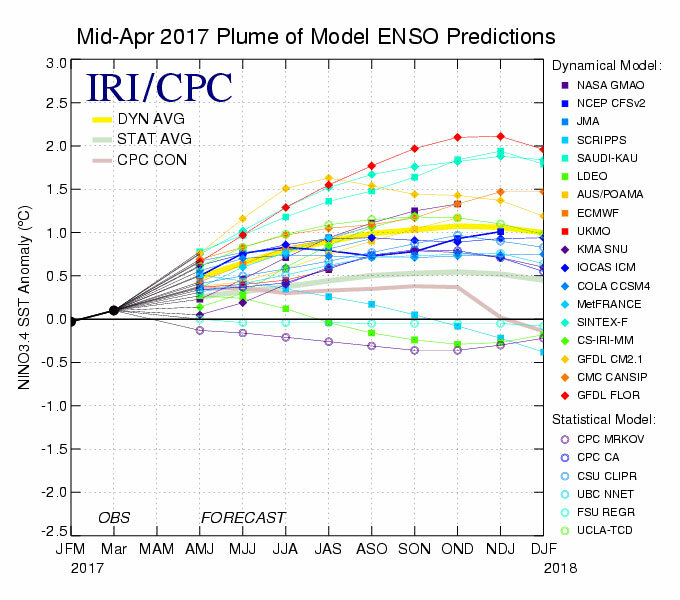 Now it looks like there may be a moderately strong El Niño before the year ends. That could contribute to additional warming in the latter part of 2017, making it more likely 2017 will set a new record. The figure above shows estimates of the El Niño index from a number of different modeling groups; typically positive values above 0.5 indicate El Niño conditions, with values below -0.5 indicating La Niña conditions (values between -0.5 and 0.5 are neutral conditions). Scientists also compare temperatures observed in recent decades to the predictions of climate models. 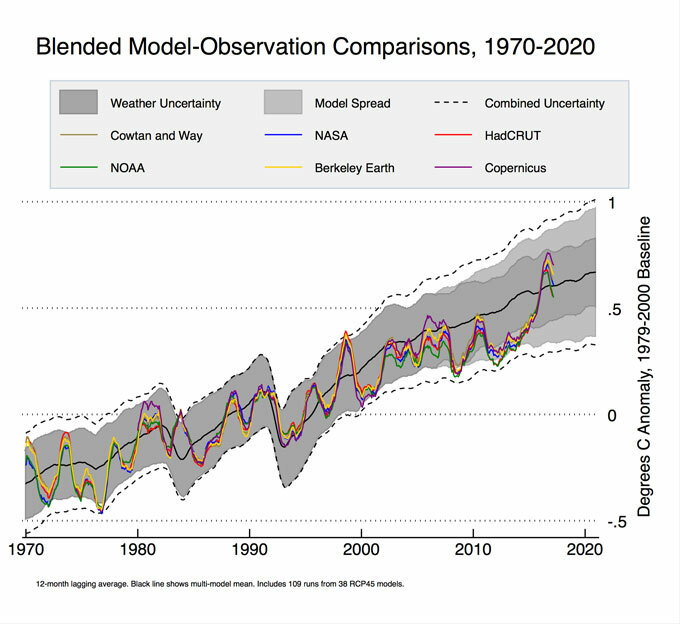 The figure above shows the six different observational records compared to the average prediction of all the climate models included in the 2015 Intergovernmental Panel on Climate Change (IPCC) report. The dashed lines represent the lower and upper uncertainty bounds of the models. The rate of warming in observations since 1970 has been about 10 percent lower than that predicted by the average of all the climate models, well within the range of projections across all the models. April 1970 through March 2017 temperature trend from Berkeley Earth. 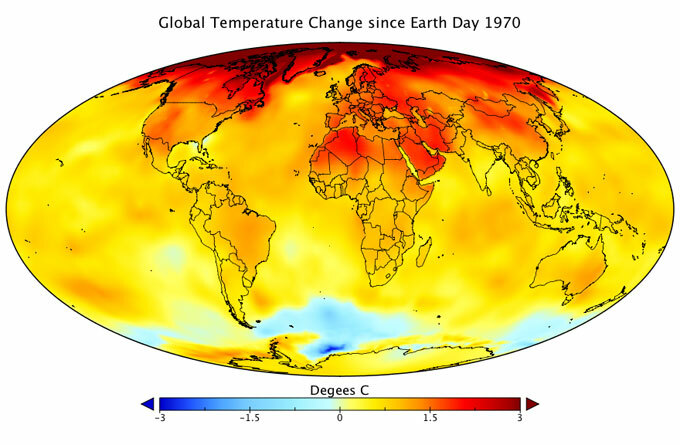 Between the first Earth Day in April 1970 and the 47th this past April 22, global temperatures have increased by 0.86 degrees C (about 1.5 degrees F). Warming over land has increased more than over ocean, particularly in the high-latitude Arctic regions. Parts of the Arctic have warmed 3 degrees C (5.4 degrees F) just since 1970. This figure shows the average sea ice extent during the period from 1978, when satellite observations began, and 2010. Both poles are shown by dashed lines, with a shaded grey area representing the two standard deviation range of values around the average. The darker blue and red solid lines show 2016 values for each day, the brighter red and blue lines the 2017 values to-date. So far both Arctic and Antarctic sea ice extent has been outside of the range of values measured in the past for most of the year. In addition to measuring sea ice extent through satellite observations, scientists also estimate the volume of the sea ice (which depends both on extent and thickness). They find dramatic declines in sea ice volume, with sea ice decreasing by around 3,000 cubic kilometers every decade. 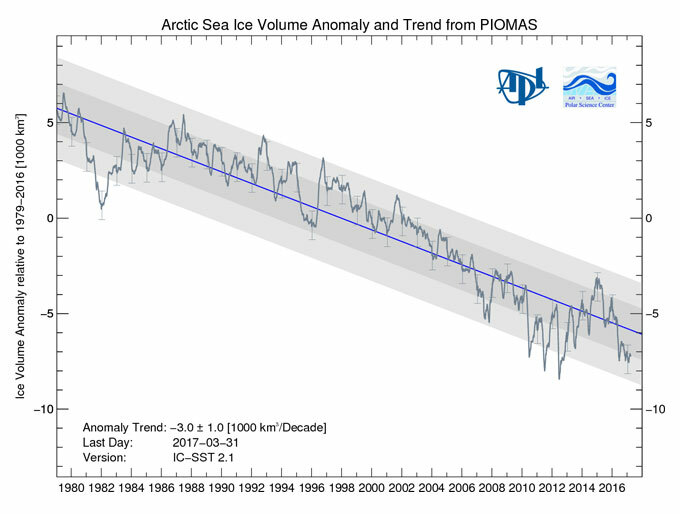 While sea ice volume is likely a bit higher in 2016 and 2017 than in the record lows recorded in 2012, there is a clear and highly statistically significant downward trend. The low volume of sea ice coming into the Northern Hemisphere summer likely presages a very low Arctic sea ice minimum (though there is no evidence yet that its likely to beat the 2012 record low). Coral reefs are in many ways the proverbial “canary in the coalmine” of a warming world. Corals have adapted to tropical waters that have very little annual variation in temperatures. As a result, they are poorly suited to temperatures much higher or lower than what they have experienced historically. If temperatures get too high for a sustained period of time, corals expel their symbiotic algae (called zooxanthellae), turn white, and slowly starve to death as warmth persists. Until the mid-1980s, no widespread coral bleaching had been observed. Since then, there have been three major global coral bleaching events associated with large El Niño events (including, most recently, 1997/1998 and 2015/2016). Now corals are also experiencing a major bleaching event despite neutral El Niño conditions. As mentioned above, El Niño events provide short-term variability around a longer-term warming trend. Because of the long-term warming, cooler La Niña events today are actually warmer than most El Niño events were back in the 1970s. El Niño events today are much hotter, as they occur on top of the long-term warming. While coral can recover from heat-driven bleaching events given enough time, the frequency of bleaching is increasing, and in a few decades bleaching events could well occur every summer, a severe outlook for most coral reefs. Figure from the ARC Centre of Excellence for Coral Reef Studies. The Great Barrier Reef could recover from these events given enough time and cooler ocean temperatures, but that prospect seems unlikely given the rate of warming experienced there. Figure courtesy of Ed Hawkins. Coral bleaching events are driven primarily by high sea surface temperatures. The oceans around northeast Australia have warmed nearly 1.5 degrees C (2.7 degrees F) since 1900, as shown in the figure above, and about 0.7 degrees C (1.2 degrees F) since 1979. All in all, it’s only one-fourth of the full 2017 calendar, and experts will emphasize that a single year’s breaking – or not breaking – previous records matters a whole lot less than longer-term trends. But for those advocates hoping for the symbolic “Another Record Year” gotcha headline or soundbite, early indications are that they may not be disappointed … just saddened by the long-term ramifications.